Dizziness and migraines can often be experienced together. Dizziness is a broad term, but is typically defined by feeling lightheaded, unbalanced, and faint. Migraines are far more severe than typical tension headaches, and are characterized by recurrent, throbbing pain that starts on one side of the head. Migraines are often accompanied by nausea and blurred vision, and can last anywhere from several hours to several days. According to The Migraine Action Association, migraines are the most common neurological condition. 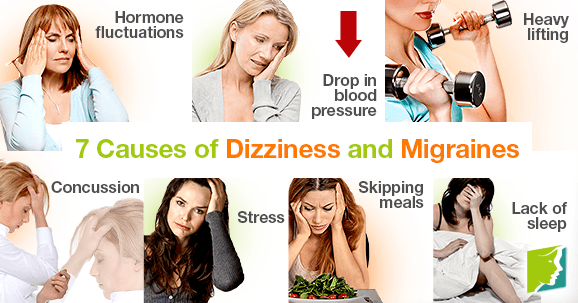 There are several causes of dizziness and migraines, so it is important to be aware of them. What Causes Migraines and Dizziness? These symptoms, which often occur simultaneously, can be the result of several factors. Some people are genetically predisposed to migraines, and these factors can trigger them. Estrogen and progesterone fluctuate during menstruation, pregnancy, and menopause. These hormone fluctuations can cause migraines and dizziness, among other frustrating symptoms. A sudden drop in blood pressure can cause dizziness, lightheadedness, and fainting. This is typically caused by standing up too quickly or after eating a big meal. Heavy lifting and other strenuous activity can cause lightheadedness and dizziness. It is important to stay hydrated and take frequent breaks when doing any kind of strenuous activities. Major head injuries can have lasting effects even months after the incident. This includes dizzy spells, migraines, and nausea. It is important to see a doctor to make sure that there is no additional swelling or serious concerns. Stress is one of the leading causes of headaches, anxiety, and many other health conditions. Letting stress build up - whether at work or at home - is a direct cause of migraines that can lead to dizziness. It is important to try and manage stress. Good ways to do this are to practice yoga or meditation, taking a bath at night, reading, or listening to soothing music. Blood sugar levels drop sharply when you skip meals, which often leads to headaches and dizziness. It is vital to eat healthy, balanced meals and snacks every three to four hours to stay alert and prevent these symptoms. Getting enough sleep every night is essential to feeling your best and for maintaining overall health. Lack of sleep is a common cause of headaches. The average adult should get between seven to eight hours of sleep every night. Migraines affect approximately 36 million Americans on a daily basis; approximately two-thirds of those migraines occur in women. Migraines can last anywhere from a few hours to a few days, and can be incapacitating. Dizziness is a common symptom of migraines, and is described as feeling faint, weak, unbalanced, and lightheaded. If you are feeling a migraine or dizzy spell coming on, it is important to drink plenty of water, lie down for a while, and take pain medication. Fortunately, there are simple techniques that can prevent dizziness and also ways to control dizziness. Don't let fatigue and dizziness ruin your day. Check out ways of reducing these symptoms here. Dizziness can occur at any age due to circumstances and each individual, but menopausal women tend to experience it more.